1. Cut apples into halves, core and slice them thinly. 2. Put the sliced apples into 1/2 bowl of water that is mixed with lemon juice, microwave for 3mins. Drain and set aside. 3. Mix apricot jam with 2 tbsp of water and microwave for 1min. Stir to mix well then set aside. 4. Place and cut slightly thawed puff pastry on floured counter top into 4 cm thick long strips. 5. Brush the strips with apricot jam, arrange overlapping apple slices (red skin facing outwards) on half of the puff pastry. 6. Sprinkle some ground cinnamon over the apple slices, fold the other half of the puff pastry covering half of the apple slices. Roll the puff pastry as one would with a swissroll. 7. Repeat steps 5 & 6 till all the puff pastry are done. 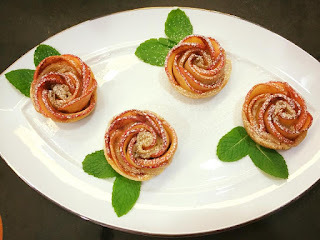 Place the apple roses in a greased muffin baking pan. 8. Bake at 190 deg C for 40-50 mins till the puff pastry is cooked through. 9. Sprinkle icing sugar over the apple roses and serve the dessert warm.